For all order deliveries, we have a close partnership with transporters and parcel delivery services. In addition to the efficiently designed warehouse, our company terrain is equipped with security cameras to monitor the products day and night. This way, all products are stored safely. 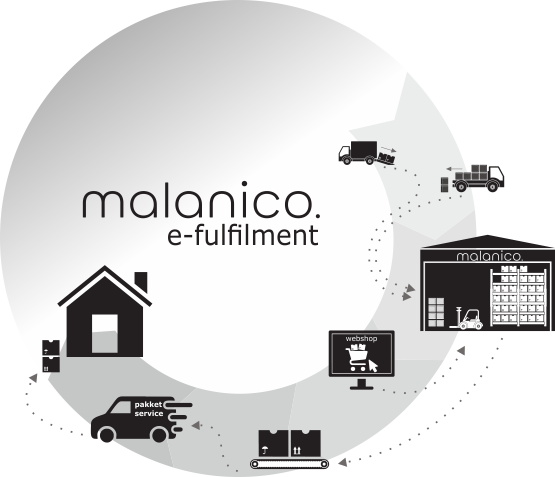 Malanico collaborates with multiple transport partners. For the delivery of customer orders, we have close partnerships with various parcel delivery services, such as DHL, PostNL and DPD. For pallet distribution, we work together with our partner MDI logistics, a transporter delivering both quick and efficient transport. We also offer crossdocking in our warehouse with several options. Crossdocking means that we receive your products, which are then immediately combined with our outgoing goods stream and offered to our transporters. This form of consolidation is especially efficient because the products are not always stocked in the inventory, do not go through the picking process, and are combined with other products. This reduces storage, labour, and transportation costs; lower costs and better for the environment! For example, we take care of deliveries to retail organisations of sales products from multiple suppliers. These are delivered to our warehouse and combined into one goods stream to the shop floors of the retailers. Of course, the crossdocking goods stream is also fully managed by a WMS, allowing us to continually monitor your shipments from start to finish. 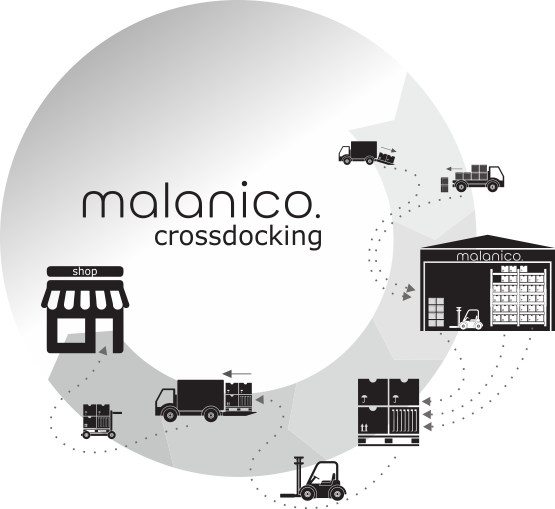 The crossdocking operation often takes place at night, but same day delivery is also possible. This always gets your shipments quickly to your customers. 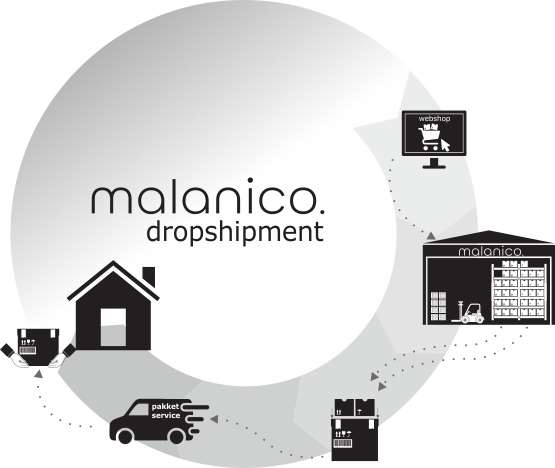 Malanico Petfood & supplies offers various drop shipment concepts within Europe. We always provide the perfect solution through flexible options in possibilities. This means you will not have logistic worries as a supplier/retailer, allowing you to fully focus on your core business; selling products, your online shop, and marketing. We are dedicated to keeping your products in supply in our modern warehouse, and pack and send the orders directly to the end user. To ensure a smooth process, we prefer to link our own IT systems to your personal ERP system or online shop. We also offer the possibility to process any returned orders. The drop shipment activities are available for B2C deliveries, but also for B2B deliveries. No need to worry about your supplies, shipment, or stocking and storing your products! We package the orders for you, print the stickers, invoices, order confirmations, and deliver the package to the package delivery service. You are only responsible for providing a customer who orders and pays. Only you are in contact with the customer! To maintain your own identity and appearance, client-specific packaging and packing slips are among the possibilities. For delivering your customer’s orders, we have close partnerships with various package delivery services and for pallet distribution we work together with MDI logistics. Our rule is: order today, delivered to the end user tomorrow (or the same day). With fulfilment, you have your own inventory and we manage it for you in our warehouse. The benefit of fulfilment is that there is no need for you to keep your inventory stocked, while always having up-to-date information regarding your own inventory. We also focus on managing your inventory and perfectly processing orders, allowing you to focus on arranging your online store and successfully putting your products on the market. Online shop orders can be placed 24/7 and enter our system immediately through coupling. Once the order is received, it is picked, checked, scanned, packed by our fulfilment team, the package is registered and given the right label, and then picked up by the transporter to deliver it the next day. Since we make use of blank packaging or client-specific packaging, the customer never notices that you outsource this process. After shipping it, you receive a track & trace code that you can automatically share with your customer. We also provide the possibility to process returned orders for you. The fulfilment service offers, just like drop shipment, the processing of orders that enter the Warehouse Management System through online shops or possible other channels. Drop shipment means you have no personal inventory and make use of our inventory.